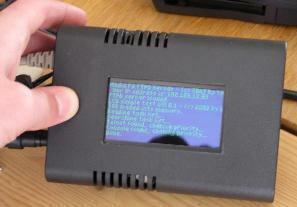 The Accumulator (aka AX) is another (better, cheaper, faster etc...) MP3 player. First of all it plays MP3 songs. It's able to work fully standalone controlled via very easy to use GUI (graphic user interface) using a remote control. It can also be connected to your local network and controlled from your workstation. Software is made for Windows, Linux and Mac OS X. How many songs can the AX hold? The largest harddisk that can be inserted into an AX is 160 Gb. An 160 Gb disk can store about 32.000 songs. How do I get my songs onto the AX? An FTP (file transfer protocol) server is running on the AX. This makes it possible to easily upload yours songs using Internet Explorer, Netscape or WS_FTP (the world most used FTP client). Can I play games on the AX? What music formats are supported? MPEG1 audio layer 1, 2 and 3 at all standard bitrates up to 320 kbit/s. You can't... yet. But if you really want one, you can fill out our pre-order form. If we get enought subscriptions we might make a first production.